Personal trainer David Last shares two of his favourite recipes. WE ALL LIKE a bit of chocolate at this time of year and perhaps some of you had given it up for lent and have been looking forward to tucking in to an Easter egg, or two, over the coming days (maybe they’re all gone!). But you don’t need to undo all the hard work you’ve done in the gym over the last couple of weeks and months by binging on store-bought, sugar-loaded chocolate eggs. Of course, everything in moderation is acceptable but there are alternatives out there for those of us who want to choose a healthier and less expensive option. No doubt you will come across these treats and healthy snacks in most new, trendy cafes and stores around the country but what I’ve started to notice is the excessive prices being charged. Paleo bars or chocolate protein bars can set you back between €2 and €4 but these recipes will make a batch and cost you a fraction of the price. Blend mixed nuts, handful of dried fruit and desicated coconut together. Add 200g of coconut oil and 2-3 spoons of nut butter to a heated pot and stir slowly on slow heat. Add one teaspoon of vanilla extract to same pot and stir. Add the blended mixture of nuts and coconut to the same pot, stir on low heat. Heat 100-150g of 75-85% dark choc into a separate pot. Apply all the ingredients from the main pot to dark choc and mix together. After two hours in the fridge, I coated it with the remainder of the desiccated coconut and added chopped strawberries and blueberries. Open can of coconut milk/cream, empty contents to bowl and whisk. Add one tea spoon of vanilla essence and mix. Add four scoops of vanilla protein to same bowl and whisk until smooth texture. When mixture is solid enough form 8-12 balls leaving half of contents in bowl. Put balls into fridge for an hour and allow to harden up. Coat each vanilla ball with more desicated coconut then pop back into fridge to remain firm. Add remaining mixture with heated dark chocolate and allow to cool for five minutes. When mixture has cooled form 8-12 dark chocolate balls then pop into fridge to cool and firm. One hour later coat each chocolate ball with some more coconut flakes then pop into fridge for one hour and allow to harden up. 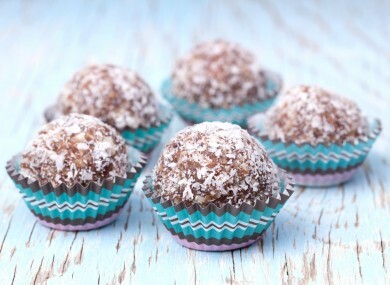 Email “Chocolate protein balls and paleo bars - Easter treat recipes for the fitness fanatics”. Feedback on “Chocolate protein balls and paleo bars - Easter treat recipes for the fitness fanatics”.